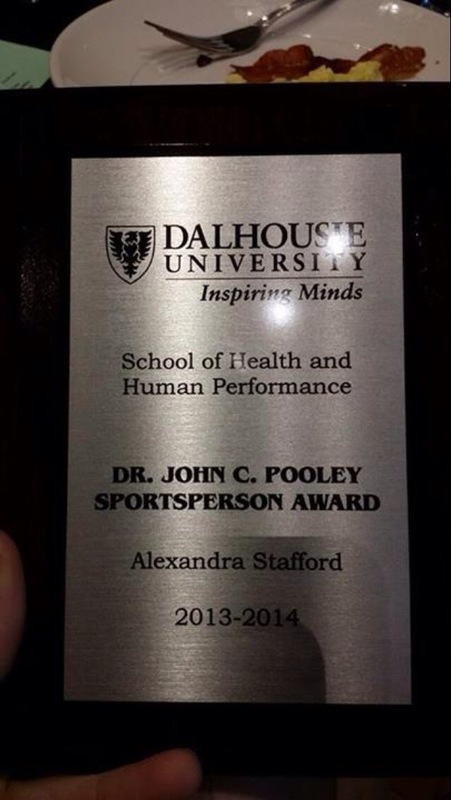 Congratulations to Alex Stafford for winning the Dr. John C. Pooley Sportsperson Award at Dalhousie Graduation this spring. Alex joined the Dalhousie University Rowing Program in 2011 and has remained an enormous contributor until 2014. She perfectly exemplifies the spirit of rowing. From 2012-2013, she served as president of our Club. She was instrumental in developing and legitimatizing Dalhousie University Rowing in the Dalhousie Student Union as well as the Halifax community. In 2013 she was involved in leading our team to win the Atlantic University Rowing Championships and compete at Canadian University Rowing Championships in Montreal, QC. Through fundraising initiatives, donation of her time, hard work and perseverance, she has excelled as a leader and has dedicated her time and expertise to the advancement of our club. Thank you for everything Alex and good luck in your future endeavours.